Any idea of who is calling the Jets/Browns game? Thanks for the information on the Jets/Browns game. Was hoping for Harlan or Gumbel calling the game as the Catalon and two Steve's team is downright difficult to listen to. From a distribution standpoint,surprising that Keven and Rich weren't sent to Indy considering more viewers will get Chiefs-Colts than Jets-Browns and Raiders-Bucs combined. Ben, thanks for taking the time to update the announcers distribution each week for the NFL on FOX and CBS respectively. I agree with Mike and I am surprised that Kevin Harlan and Rich Gannon are calling the Jets-Browns and I personally thought that with the combined records of the two teams that Andrew Catalon, Steve Beuerlein, and Steve Tasker would announce that game. NYC is the largest media market in the world and despite the records of the Jets and Browns this is a Harlan, Gumbel or Dedes game to call. The Catalon and Tasker and Beurelein team is so boring and should not even be the six team. Harlan and Gannon should be definitely calling the Jets/Browns and hopefully next week Harlan or Gumbel will get Jets/Dolphins. I remembered that the Andrew Catalon crew announced the Jets-Titans and Jets-Dolphins games in 2014 at the end of the season since the Jets had a horrible record and those games were meaningless. However, it makes sense that unless the Jets are that terrible again that the Andrew Catalon crew will not announce their games. CBS should never have left Gus Johnson go as he is much better than Catalon and both Steve's are awful. That is one bad team. Tom McCarthy and Adam Archuletta call a better game than Catalon and the two Steve's and they should be the six team. Also, would love to see Nantz and Simms in a three-man booth with another analyst to give it some personality. Do not know why Boomer Esiason is not on that team or on one the broadcast teams is he much better than some of the analysts CBS currently has announcing their games, as Simms is awful and do not get all the over hype with Eagle and Fouts. Like Gumbel and Green and Harlan and Gannon and even Dedes and Wilcots over the top two CBS announcing teams. Sorry needed to proofread my last post.... Here is it spellchecked! CBS should never have let Gus Johnson go as he is much better than Catalon and both Steve's are awful. That is one bad team. Tom McCarthy and Adam Archuletta call a better game than Catalon and the two Steve's and they should be the six team. 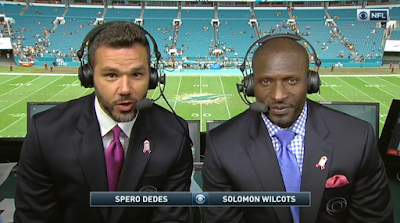 Also, would love to see Nantz and Simms in a three-man booth with another analyst to give it some personality. Do not know why Boomer Esiason is not on that team or on one of the broadcast teams as he much better than some of the analysts CBS currently has announcing their games, as Simms is awful and I do not get all the over hype with Eagle and Fouts. Like Gumbel and Green and Harlan and Gannon and even Dedes and Wilcots over the top two CBS announcing teams. I guess CBS keeps Simms up there for being a Superbowl Winner. If that is the case Jeff Hostletter should join him in the booth as he won the Super Bowl for the Giants when Simms got injured. He may have won a Super Bowl but Simms needs to be demoted to a lower team as he is boring and not a top analyst. I get what you are saying for sure. Surprised that Peyton Manning or Bret Farve never made it into the booth once they retired as Manning would be an upgrade over Simms or even moving Esiason to the booth since he does Monday night Sirius radio broadcasts would be great for CBS. My cbs station Wyou is carrying the Jets Browns game.